Seasonal living is about as old-fashioned and pioneer as you can get, where families are in touch and plan their lives (and kitchen) around the seasons. Even if you don’t live on a full homestead or have distinct seasons, you can use these tips as we move into the fall and winter season. Specifically today we are talking about tips for seasonal living, both within your home food preservation and stocking that natural medicine cabinet. So follow along on the journey in what we are doing, and what you can do in your home to get you ready for fall, winter, and even into the next year. This episode is bought to you by the Pioneering Today Academy. 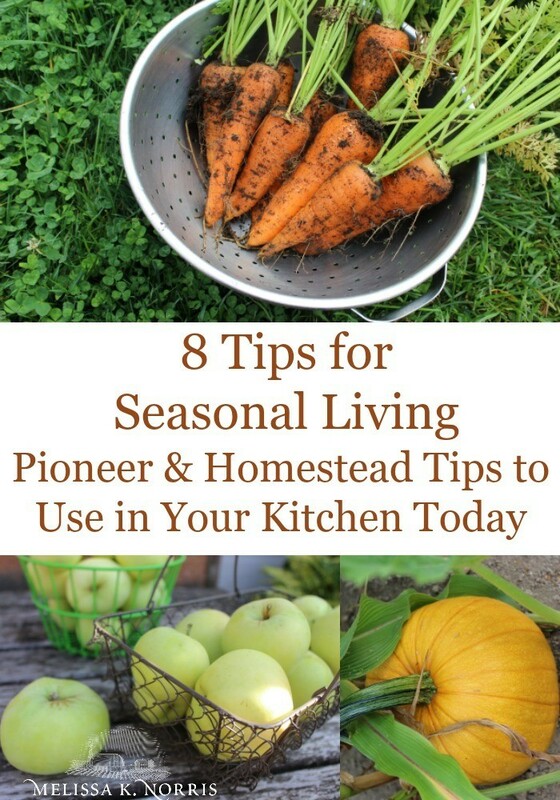 Listen below to, 8 Tips for Seasonal Living- Homestead & Fall Preserving, Episode #157 of the Pioneering Today Podcast, where we teach families how to grow, preserve and cook their own food using old-fashioned skill sets and wisdom to create a natural self-sufficient home, with, or without, the homestead. When doing anything, I want to go in with a plan. This is with my cooking, gardening, our preserving, and it’s what I teach in the academy as well. I’m going to use carrots as an example, because it’s what we are harvesting today. What you will be using the specific produce for? I ask myself, “what I’m going to be making with it, what way is it going to get used, so I can preserve it in a form that I need it when I go to make that specific recipe. I’ve also got to check my freezer and clean out any vegetables or meats from last year to make room for this year’s harvest of the items that we don’t can or use other preservation methods with. We also have butcher season coming up soon, so I need room in my freezer for that. How to make things fast and efficient when preserving carrots (or other vegetables). Chop the tops off and toss those to the chickens, because they love to get fresh greens, or put it in the compost pile if you don’t have any livestock. Wash and peel. The extra peelings go in my bone broth bag. (I save onion skins, garlic skins, the end, odd and ends from celery, carrots, peppers, anything like that and put in the freezer to make bone broth at a later time). 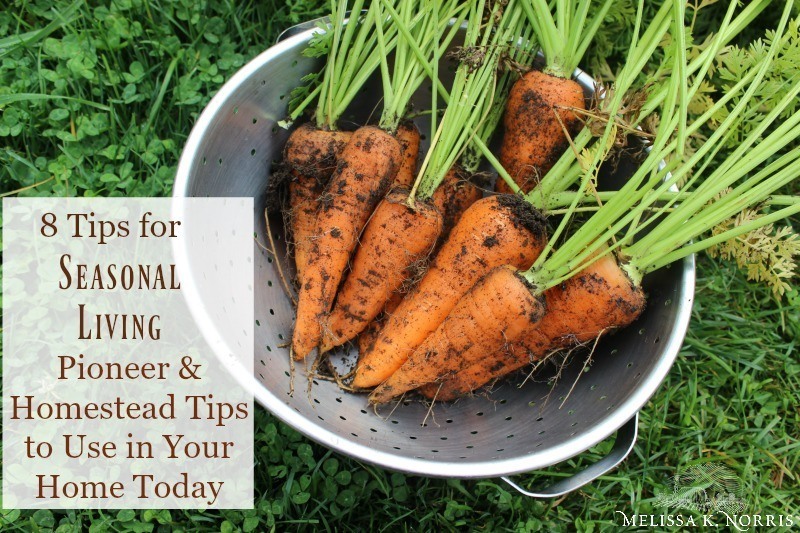 Decide how I want to use these carrots throughout the year in different meals. Carrot cake is going to be a must and carrot muffins, so baking-wise that means shredded carrots. You could grate carrots and put them in the freezer, but I don’t have the room for that, so I’m going to be dehydrating mine. You can also dehydrate carrots in rounds, (just like if you were chopping a carrot up right and slicing it into those rounds). Preserve them planing what recipes and meals you want to use them for. Some vegetables you absolutely need to blanch before you freeze them or you dehydrate them. The reason for that is when you blanch something, you are actually stopping the enzymatic process (once something is picked it still has enzymes that are at work), and blanching stops those enzymes. It also helps to retain the color. With freezing, especially true with winter squash, if you don’t blanch them first, you just peel them and try to freeze them raw, they will not cook right. Trust me. You only blanch them for about two to three minutes in hot water. To decide if I need to blanch or not, I look at the way I’m using them once they’re dehydrated. Blanching prior to dehydrating allows them to reconstitute faster. So with my shredded carrots, I will use them in bisque soup, which is cream-based and doesn’t cook for very long, and I’m also going to be using them in baked goods, nobody wants a crunchy carrot when they’re taking a bite of moist carrot cake, right? So I’m gonna blanch them, then dehydrate. I don’t blanch veggies that will cook longer. My carrot slices carrots that I’m cutting into rounds or in slices, I don’t blanch because those are going to go into stock, broth or maybe some vegetable soups as well. They are going into meals that will be cooking for a really long time, so I can save my time by not blanching them before dehydrating. Bone broth is a great natural remedy especially going into fall and typically cold and flu season. Now, I’m not a medical professional. I’m not a certified herbalist. I’m not giving you medical advice. This is just for informational purposes. There was a study done by the University of Nebraska Medical Center and in their findings, the team found that the movement of neutrophils (has to do with your white blood cells), which when you’re fighting infection, was reduced. This suggests that chicken soup might have anti-inflammatory activity which may help symptoms and shorten upper respiratory tract infections. With bone broth, you’ve got your minerals and vitamins and they are very easy to digest once they’re in broth form. You’re also getting chondroitin sulfate, glucosamine, gelatin and collagen. All of which is excellent for you gut health, your joints, and helps to boost your immune system. 1. cook it for a really long time so you get the gelatin and collagen in (unless you’re using the Instant Pot, then it’s only 2 hours). 2. Make sure that it is from animals that were raised ethically, and organically, and pasture-raised, if at all possible. I can have bone broth going within 5 minutes by using my prep tips of having your broth bags. When I roast our chickens I will then freeze the bones and the carcasses of them after we have cooked them. So I take out those carcasses, and with my bag of frozen vegetable scraps and I can have bone broth going in as much time as it takes me to dump them in the pot. Fall is harvesting herbs time as well, and you want to knowing how you’re going to be using them on the end part. I’m drying them for cooking and I’m also restocking all of my natural remedies in our natural medicine cabinet this time of year too. Drying herbs is what most people do. You can do them in the dehydrator at 95 degrees Fahrenheit or lower. Or you can do it the old-fashioned method where you pick them, tie them together and hang them upside down until they’re totally dry. For culinary purposes I’m gonna dry most of my herbs and flowers. When using them to make tea, cooking with, or/and infusing in oil to then make herbal-infused oils, balms, soap and salves, you want them to be dry. Typically in the fall is when I will make up a whole bunch of our soap, then I usually only have to make soap once or twice a year we’ve got all of our bars of our homemade soap to take us all the way through the year. Soap and salve making also coincides very well with butcher time if you’re going to be using tallow and/or lard from your own animals. We butcher in the fall because our animals are coming off of grass-fed pasture. One of the reasons why people butcher in the fall is because your animals are coming off of the summer from all of the grass and foraging and they’re at their highest weight. This means you’re going to get the most meat and you’re not having to purchase hay or feed them through the winter months. The other reason is because traditionally back in the pioneer days, they waited until the weather had turned cool in order to butcher because they would be salting and having to store their meat in a cold house or a spring house. Your meat is going to last longer throughout the winter if you can do this when it’s cold out when using those older methods of food preservation, aka no deep freezer. The other thing that we do this time of year, other than making applesauce, is taking all of those apple scraps (the peelings, cores, all the other scraps), and making my own organic,apple cider vinegar. We’re talking the real stuff, the fermented kind. I think some of the most rewarding things I’ve seen from members who are in the academy are those just like me who have seen such a difference in their quality of life and have found healing from real things by moving to going back to wholesome foods and natural foods. Now I’m not saying that just because you go natural is a cure-all and you’re gonna cure everything, because that’s not true, but your quality of life I personally have definitely, definitely seen a difference. We would love to have you join the community and to check out if the Pioneering Academy is something for you or not, but you do need to check it out by October 3rd, because that’s when we’re shutting the doors down from enrollment and our members we will be moving forward, and we’d love to have you join us. But regardless if you join the academy or not, I am so thrilled that you are listening to this podcast and you are taking the steps to create a more natural and old-fashioned home for your family and yourself, and I will be here back with you next week.